Audioquest's new DragonFly USB DACs work with phones and tablets | What Hi-Fi? 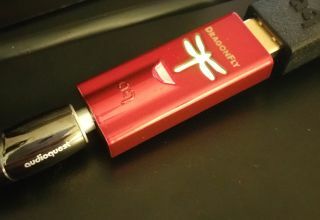 The new DragonFly Black and DragonFly Red USB DACs will work with Apple and Android devices, and start from £89. There's a new Beetle DAC, too. We are big fans of the DragonFly DACs, so we're happy to report there are two new upgraded models on the way. First unveiled at CES back in January, Audioquest is officially launching the DragonFly Black and Red products today, complete with UK pricing. The new Audioquest DragonFly Black USB DAC, preamp and headphone amp will cost £89, which is less than the existing DAC, the five-star DragonFly v1.2, which it will ultimately replace, while the DragonFly Red is £169. As well as the drop in price, Audioquest claims better audio quality, lower power consumption and, crucially, compatability with Android and Apple smartphones and tablets. You'll need Apple's Lightning-to-USB camera adaptor to connect to iOS devices, or a Made for Android adaptor (Audioquest makes the DragonTail USB adaptor) for connecting to Android devices. Elsewhere, Audioquest says it has chosen to limit the DACs to 24-bit/96kHz, to make them easier to use, with no extra drivers required. The company also says "faster processing can mean more noise", negating the potential advantages of 24-bit/192kHz hi-res files. The DragonFly Black uses the 32-bit ESS 9010 DAC, the same headphone amp and analogue volume control as in the DragonFly v1.2. The Red claims superior sound to justify its higher price and uses the 32-bit ESS 9016 DAC and a "bit-perfect" digital volume control. It also boasts a higher power output, in an effort to drive a wider range of headphones. Audioquest claims the Red has more "torque, grip and muscle" than the Black at the same volume, sounding cleaner and clearer. We look forward to finding out. Still in the pipeline is the Audioquest Beetle ($199) - also launched at CES - which sports a slightly larger design aimed more directly at desktop systems, TVs or set-top boxes. As well as the USB connection, there is improved flexibility with the addition of a digital optical input.